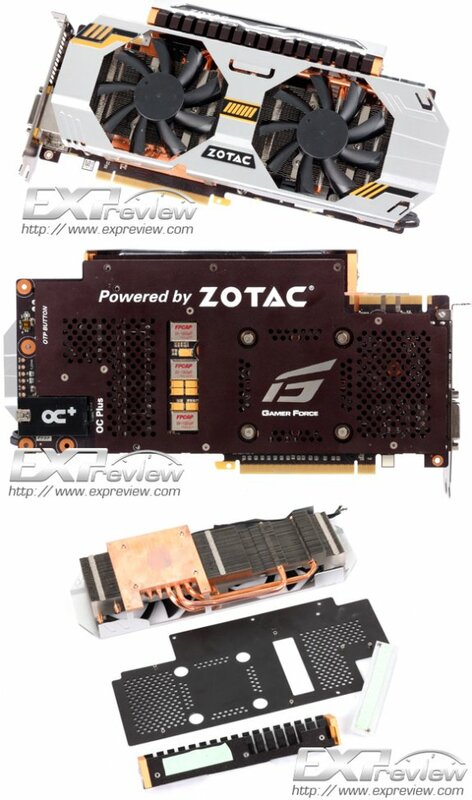 TPU came across a preview of Zotac's GeForce GTX 680 Extreme Edition over at Expreview. This new card features a base and boost clockspeed of 1200MHz (vs stock clockspeed of 1006MHz) and 2GB GDDR5 memory clocked at the standard clockspeed of 6000MHz. The standard core voltage is 1.212V and Zotac told Expreview that the card is capable of delivering up to 1.5V to assist in extreme overclocking. According to Zotac, a core clockspeed of 2GHz might be attainable in a best case scenario using extreme cooling, excellent overclocking skills and some luck. Apart from a strong VRM (detailed in the older article), the card is also backed by several nifty features, such voltage measurement points, extreme-cooling optimized BIOS, and adequate-looking VRM cooling. The USB mini type-B connector on the back of the card turns out to be not a connection to an OC module, but a USB connection to the motherboard. ZOTAC is routing the card's SMBUS to its Firestorm OC software over USB. Maybe they haven't figured out [how] this could be done through the NVIDIA driver interface, or they didn't trust NVIDIA. For example, NVIDIA blocks SMBUS access to components that they deem "sensitive".